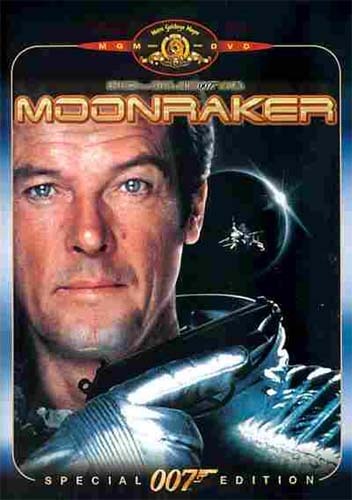 James Bond investigates the disappearance of a space shuttle. James Bond arrives in Rio de Janeiro with a Concorde from Air France. Aérospatiale-BAC Concorde 101 of Air France. A Boeing 747 carries the Moonraker in the pre-title-sequence. When Drax´ men hijack the Moonraker, the 747 explodes. The model is featuring N905NA carrying copy of Enterprise OV-101 space shutle. Boeing 747-123 SCA and Rockwell Space Shuttle (model). James Bond returns from his African job in this plane, but the pilot and the air hostess are working together with Jaws to kill him. The pilot shoots at the controls, before he is pushed out of the plane by Bond. Then, Bond is pushed out of the plane by Jaws. Registration N5VH, c/n 209 built in 1969. Reg. N5VH Handley Page HP.137 Jetstream 1 of Apollo Airways. When Bond arrives in Los Angeles (Los Angeles International Airport), Corinne flies him to Drax's chateau with this helicopter. In Rio de Janeiro, James Bond and Dr. Goodhead watch one of Drax' airliners which carries material for the Moonraker Program. The writing DRAX AIR FREIGHT is a fake of course, this plane was in fact property of the Brazilian airline VARIG. Lockheed L-188A Electra of VARIG-Viaçao Aérea Rio Grandense. Two DHC-6 from Golden West Airlines can be seen at Los Angeles International Airport. De Havilland DHC-6-200 Twin Otter of Golden West Airlines. When 007 arrives in Rio with the Concorde, a TransBrasil 727 can be seen taxiing to the runway. In the 1970's TransBrasil was showcasing it's "Colorful Energy" series by painting each airplane in a different scheme. This particular 727, registered PT-TYU, c/n 19109/271, was painted in orange & green to represent oil. Reg. PT-TYU Boeing 727-27C of TransBrasil. When 007 leaves the Concorde, a Varig 707 can be seen parked between the Rolls-Royce and the Ford. Reg. PP-VJY of VARIG-Viaçao Aérea Rio Grandense. This page was last modified on 20 November 2015, at 14:36.